PHOTO BY Jennifer Fumiko Cahill. 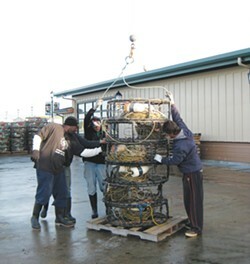 Crews Preparing crab pots for loading. On a strangely warm, cloudless January morning, a handful of people stroll along the boardwalk, stopping to point across the water at the crowd of boats docked at the Woodley Island Marina. Behind them, where the boardwalk ends at the foot of C Street, stands the newly opened Fisherman's Terminal with its sea-green roof. The other side of the building is a maze of pallets stacked with crab pots ready to be loaded onto boats. Sandy Ryan, lifelong commercial fisherman and weighmaster for Wild Planet Foods, squints in the sun at her watch and gives a freckled grin. "In 20 minutes, the fishermen will be able to drop their pots." It's almost noon on Jan. 13, on the cusp of a crab season that's been delayed a month. In a few hours, the nearly empty dock will be humming with forklifts and dock workers. "Look at them," she teases her crew, who are breaking for lunch before the boats arrive, "like lizards sunning themselves!" The terminal took 15 years, $2.4 million from the federal Economic Development Administration, $800,000 from the Eureka Redevelopment Agency and a tremendous amount of luck to build. It is a critical piece of the waterfront revitalization plan, and it squeaked in just months ahead of the state's virtual elimination of all redevelopment agencies. Aside from a few outdoor sculptures, there is as yet little for visitors to see, and the terminal's opening ceremony in September may have seemed anticlimactic. Those who planned the terminal hoped it would bolster the fishing industry, providing work space for industrial processers, room for commercial fish buyers to connect with sellers, and warm space for workers to take a break. For workers, residents and tourists alike, there would be a fish market, a café and an oyster bar. So far, though, only the work space has materialized. The Shelter Cove café owner who wants to set up shop there is still negotiating with the city over financing, now that the redevelopment agency has been disbanded. 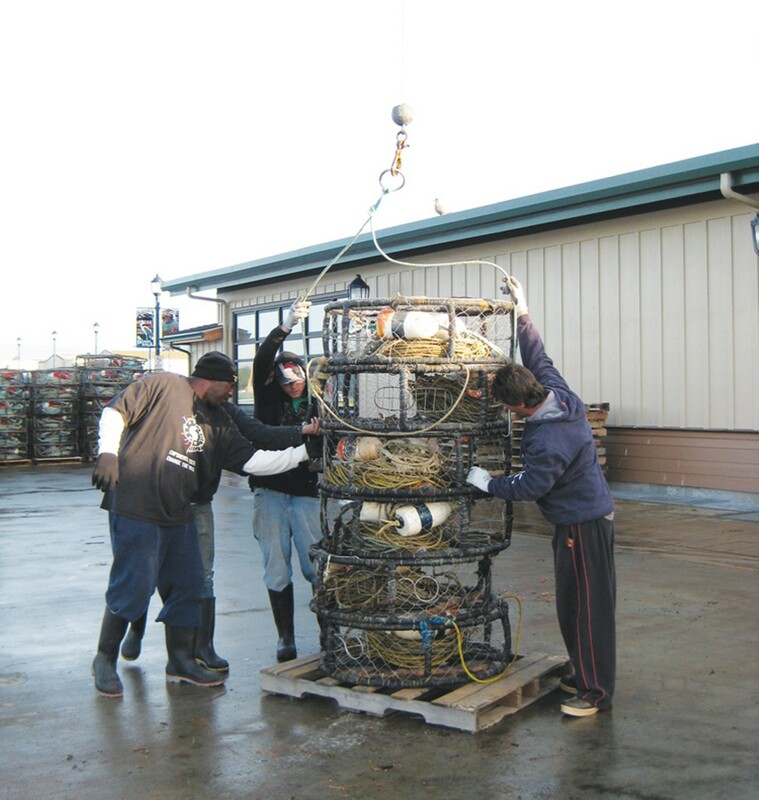 At around 4 p.m., the Pacific Seas pulls into the dock, and Ryan's crew starts shuttling crab pots onto the deck. Two men hook ropes onto a stack of pots, then raise the stack with a hoist and slowly swing it out from the dock to the boat. Captain Tom Wallace, a lanky man with sandy hair, meets his wife at a side gate to retrieve a pot of beef stroganoff for dinner aboard the boat. Wallace likes the new terminal, and won't mind tourists watching him work. He hopes a restaurant overlooking the dock will help sales. There are still some glitches, though. It can be downright dangerous out here with all the forklifts zipping around, and some crews on the dock have complained about homeless people wandering into the work area and either tampering with equipment or using the area as a bathroom. Wild Planet, which has set up shop in the new terminal, is looking into whether a chain or some other barrier can be installed. Eventually, the showers Wild Planet plans to install will be welcomed, too. Showers are especially important during salmon season, Wallace says, "when you're on the boat for a week at a time." Still, Jeff Huffman, Eureka Dock Manager for Wild Planet, says, "this is like a Cadillac to us now," waving a hand at the part of the building the company leases. It will likely be another year before Wild Planet has all its equipment squared away, but it can do what's needed for now. The building not only offers a break room with heaters for warming up on cold, wet nights, but also the option to process fish or cook crabs in the future, which can't be done outdoors. That kind of processing, if and when it happens, could mean more jobs. Wild Planet has already expanded from eight or nine workers banding crab during the day to 15, and from four or five on the nightshift to eight. Vice President and co-founder Bill McCarthy says he expects to hire more. On top of that, Coast Seafoods, which buys and processes oysters and was recently bought by Pacific Choice, has signed a lease and started moving gear into the terminal. Coast Seafoods Operations Manager Greg Dale is enthusiastic about the possibilities in the structure, saying, "Over the years, it's going to turn out to be a good transition ... from the T-shirt shops to the industrial processing" section of the waterfront. The Wild Planet crew is also unloading for another processing company, North Coast Fisheries. Huffman says the building, with its loading docks and staging area, makes it easier to unload for more companies. Currently, fishing crews can sell to Pacific Choice, Caito Fisheries, Wild Planet, Nor-cal Seafoods, North Coast Fisheries, and Ocean Gold, a buyer out of Washington. Ryan, the Wild Planet weighmaster, says that having multiple buyers on the waterfront is healthy for the market. "We need more buyers on the dock. More buyers [mean] better prices for the fishermen," she smiles, adding, "[and] more jobs." The retail side of the building is still a raw, empty shell, with rebar poking up from the floor. Now that the Redevelopment Agency is being dissolved and the city is taking over, it's unclear how long things will remain that way. The final renovations and tenant negotiations will be left up to the City Council. Cindy Trobitz-Thomas, who was director of redevelopment and housing and now is in charge of dissolving the agency, said she doesn't know where the money will come from to finish things. "I am concerned about the café and whether [the successor agency is] going to have the financial wherewithal to make the improvements needed for a tenant to move in." For the past three months, the Redevelopment Agency has been negotiating with Jack Sanford, a commercial tuna fisherman and owner of the Shelter Cove Deli. He plans to open Fish House, a casual cafe serving his deli's very popular fish and chips, baskets of fried seafood and chowder. He and his daughter, Kimberly Sanford, who will run the place, will also have an oyster bar with beer and wine and a retail fish counter. The roughly 1,500 square foot café will require the building of a storage loft and a back hallway for prep and moving supplies and trash in and out, which will eat up about eight square feet of Wild Planet's space. The necessary equipment is expected to cost $76,000, and the estimate on the finishing work has not yet come in, according to Marie Liscom, the Redevelopment Agency's special projects manager. How this work is paid for depends largely on what kind of public and private loans Sanford and the city can pull together. Redevelopment and city staffers will have to scramble to find funding sources and then bring their proposal to the city council. Sanford and his daughter are still optimistic. "The location of that particular building and the boardwalk and the renovation Eureka has planned for that area is pretty enticing," he says, and a seafood restaurant "hasn't been down there since Lazio's." At one point, Lawrence Lazio, former owner of the famed Lazio's where locals and tourists flocked for seafood and a view of a working fishery, considered moving into the space, but he balked at the rent and layout. Kimberly Sanford agrees that the space precludes anything as big as Lazio's old place, but the Fish House will still offer a great place to grab a bite and watch the boats unload. The Sanfords are even talking about having some local bands play in the outdoor seating area. While Jack Sanford is pleased with the work the city and the Redevelopment Agency have put in so far, he expects things to move slowly with any public entity. He's hoping the Fish House will be open this summer. But it's still winter now, and as the sun goes down, it gets just cold enough to think about the heater inside. The boats are coming in more steadily now, all lit up on the dark water. This will go on all night, and come Sunday, the boats will be back at the terminal, teeming with crab. Time will tell if the terminal lives up to its potential, but for now there are pots to load and work to be done.